Plesk Billing – Are There Any ModernBill Alternatives? ModernBill, renamed by Parallels as Plesk Billing, is now a standalone billing system product that comes with an Unlimited Plesk Panel License. While Plesk Billing and ModernBill were once considered the leaders in the industry, there is no doubt that this glory has faded and that the billing system now seems as though it is destined solely for the history books. For people still using Plesk Billing, the search for a better alternative is certainly not uncommon. If you are seeking a better alternative to your Plesk license, you will find that there are actually a number of options available to you. 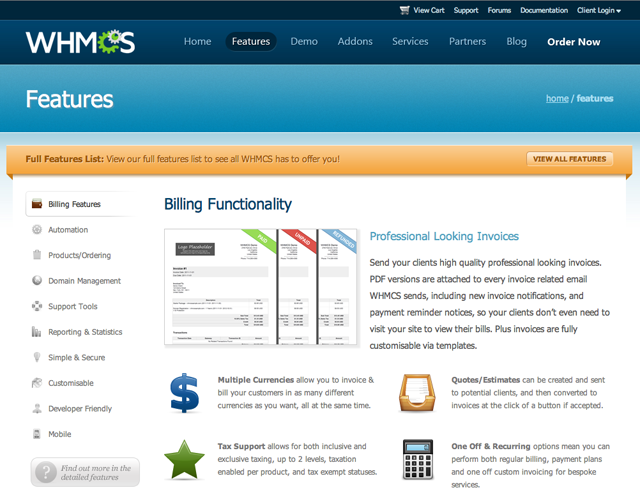 WHMCS is the best way to manage your client invoicing needs. With WHMCS, you no longer need to worry about processing your invoices because the automated invoicing feature can take care of that task for you. WHMCS will automatically bill your customers on a recurring basis for any subscriptions that you have setup. 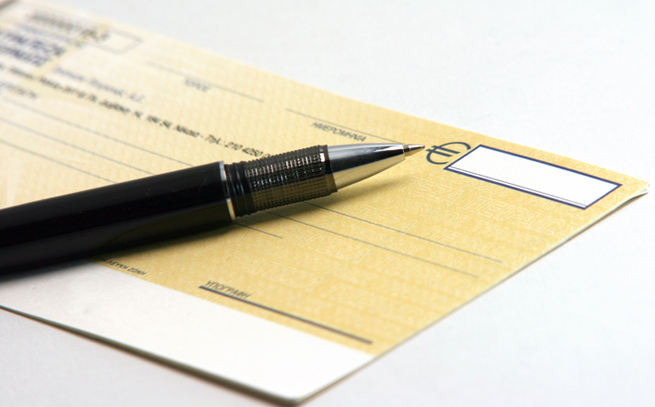 If you prefer a manual method, you can always generate an invoice manually whenever you would like to as well. cPanel and WHMCS work seamlessly with one another so you can create a completely streamlined management process on your control panel. cPanel client management is very simple with the WHMCS billing system because there are so many adaptable and customizable features that you can take advantage of at any time. Integration of billing systems is extremely important when it comes to automation and virtualization technologies. 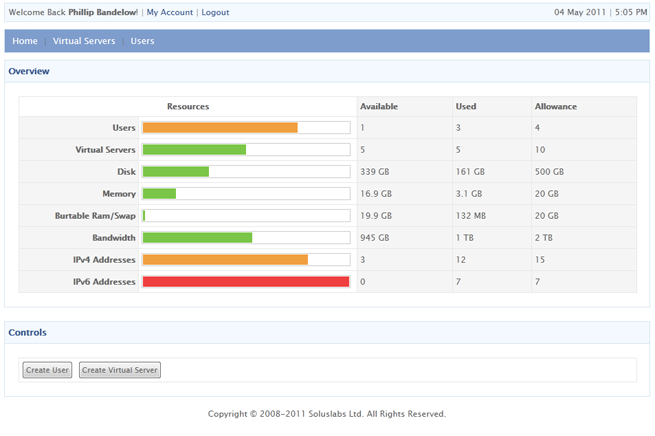 SolusVM has done an excellent job with integrating into existing billing systems. Most virtualization technologies are not integrated, requiring additional days or weeks of coding. SolusVM does not require that type of coding, and you can start selling your newly created VPS services the same day you purchase a SolusVM license. If you are looking for a reliable WHMCS Reseller, you may want to begin by considering that you will have a lot of options to consider. Most hosting companies are able to provide you with a WHMCS license. 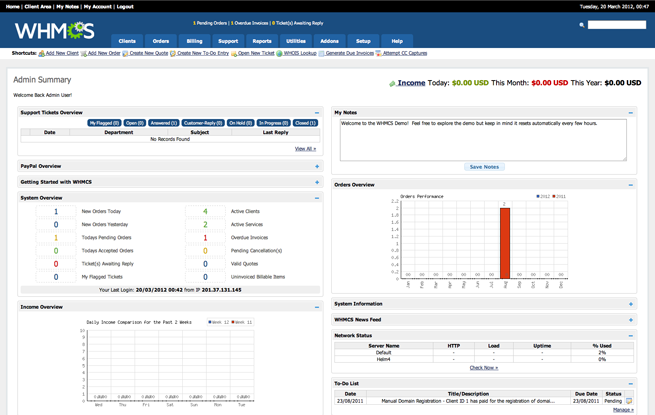 However, there are very few companies that actually provide a WHMCS license as a stand-alone license. Normally, licenses are bought in conjunction with a hosting plan, which can make it more complicated and time consuming for you to purchase only one license. You may also want to find a WHMCS reseller that offers you end user support because many resellers do not offer this service. For many resellers, offering WHMCS is just an optional extra. Their packages often include other primary services that are not related to WHMCS, and this can make it more challenging to obtain necessary support after you have licensed the software program. At LicenseCube, you will find that we offer you the option to purchase a WHMCS license in a straightforward, simple fashion. You can obtain as many licenses as you need from a trusted reseller, and we also provide you with end user support so that you can get the most out of your new software program. You will see a vast amount of support services offered by LicenseCube that are not readily available from other providers. The support services provided are aimed at answering any questions that you may have about the product. If you have a question about anything license related, you can trust LicenseCube to give you the answers. The support that you will receive is responsive and trained to answer your questions. If you are in search of a WHMCS license, then you will find that purchasing from a reseller allows you to license the product affordably while still gaining all of the necessary support that you need. 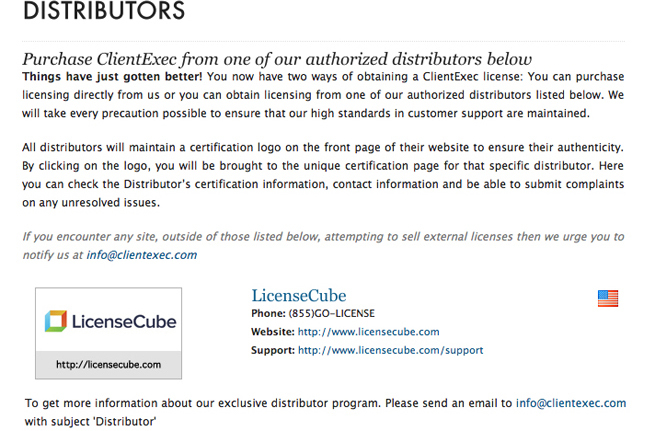 LicenseCube the Official ClientExec Distributor! LicenseCube has worked tirelessly to form an action plan with ClientExec, and we are now an official distributor of ClientExec licenses. As a ClientExec partner, we are not able to offer discounted rates on the software license so that you can find the most affordable price on your license. In addition to providing all of the ClientExec features and services, our licensing program will also allow you to take advantage of the LicenseCube API. The API capabilities that you will be able to take advantage of with a software license from LicenseCube are unparalleled, and it will really allow you to take the licensing services to the next level. With the LicenseCube API, you will not be able to order any license that you need and that we offer so that you can easily create the virtual environment that will allow you to manage efficiently, automate, and streamline your business tasks. The LicenseCube API allows you to place orders without manually logging into the site every time you need a new software license. Additionally, the LicenseCube API will give you the opportunity to use pre-made modules that will snap into your billing system, so that you can become a license reseller in virtually 20 minutes! The LicenseCube API and becoming a ClientExec partner has really allowed us to enhance the services that we provide so that we can better serve your needs. If you are looking for a specific type of license, we are ready to accommodate your needs. We offer you the ability to streamline your business so that you can seamlessly integrate the control panel, billing system, and auto-installer features that you need quickly and easily. At LicenseCube, we are dedicated to providing you with the support that you need to fully take advantage of all of your opportunities. As a ClientExec partner, we are now able to offer you the full feature set at a discounted rate as well as the ability to use our exclusive LicenseCube API. WHMCS – Branded or Non Branded? In terms of branding your business, one of the most important aspects that any web developer or hosting company will need to address is which billing system they will choose to work with. Should you choose a billing system that carries the name of the author of the software, or should you choose another type of billing system? As a website owner, you will also need to decide whether you want a branded or non-branded billing system. You may be wondering if there is really a difference between branded vs. non-branded billing systems. Does one type of system have additional features? What sets these systems apart? The short answer to these questions is that they are essentially the same pieces of software. Whether branded or non-branded, a software license will offer you the same benefits. The only difference between a WHMCS license that is branded and a WHMCS license that not branded is that you may be able to pay a little less for the non-branded software. Branding WHMCS will usually require that you pay a little bit extra to your software provider for the billing system. As a business owner, you will really just need to decide which type of billing system is right for you. There is no real difference between the WHMCS license offered without branding as compared to the WHMCS license that is offered with branding. Your billing system is an integral component of your business, so you will need to make a choice on which type of software license is right for you. WHMCS is one of the most popular billing systems on the market because it provides a myriad of different features that can enhance your ability to manage client accounts and provide custom invoices.